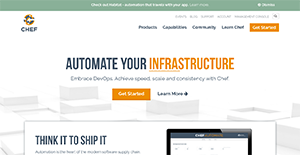 Chef.io is a feature rich, robust automation application that efficiently turns infrastructure into code. Whether you’re working in the cloud, on-premises, or in a hybrid environment, Chef simplifies the way you manage and monitor your infrastructure by automating how it is configured, deployed, and managed across your network, regardless of its size. Chef leverages a pure-Ruby, domain-specific language (DSL) in constructing its system configuration “recipes”. Chef is mainly used to streamline configuration and maintenance-related tasks of a company’s servers. The platform offers integrations with a variety cloud-based platforms such as Internap, Amazon EC2, Google Cloud Platform, OpenStack, SoftLayer, Microsoft Azure, and Rackspace. Chef comes with a plethora of solutions dedicated for both small and large scale systems, with features and pricing for the respective ranges. Chef provides users with unmatched automation that results to fast and flexible IT. The platform simplifies how you build, deploy, and manage your IT offerings, thus saving you time as manual work processes are taken out of the equation. Chef’s automation capability also decreases the number of errors that stem from configuration drift and risks from non-compliant nodes. Environments are easily reproduced after failures as well. The system features a search-based configuration that can be used to dynamically update node configuration based on data from other nodes. Chef also guarantees continuous delivery for applications and infrastructure via its robust pipeline that comes with code review and automated testing for your cookbooks and your applications. Chef claims to be the best platform for any scale. The system can handle 50 servers on AWS or Azure, or hundreds of thousands of servers across multiple datacenters, public and private clouds, and in heterogeneous environments. That means safeer and easier delivery of fast, flexible IT. With Chef, users enjoy massive Infrastructure Automation. Users can create a code-based model for your infrastructure. That also means consistent deployment of servers and scale applications while easily aligning resources with particular policies and business goals. Chef offers users with unparalleled versatility that enables them to fully optimize their cloud strategies. With integration with major cloud services such as HP Cloud, IBM Smartcloud, Windows Azure, Amazon EC2, VMWare, Google Compute Engine, and more, Chef users have everything they need to make the most out of their processes. Since each enterprise has specific business requirements, it is prudent for them to refrain from looking for a one-size-fits-all perfect software application. Needless to say, it would be futile to try to find such an app even among popular software applications. The intelligent thing to do would be to catalog the various essential factors that need consideration such as required features, budget, skill levels of employees, company size etc. Then, you should do your homework thoroughly. Read some Chef.io reviews and look into each of the other systems in your shortlist in detail. Such exhaustive research can make certain you weed out ill-fitting applications and zero in on the system that offers all the features you need for business success. How Much Does Chef.io Cost? We realize that when you make a decision to buy IT Management Software it’s important not only to see how experts evaluate it in their reviews, but also to find out if the real people and companies that buy it are actually satisfied with the product. That’s why we’ve created our behavior-based Customer Satisfaction Algorithm™ that gathers customer reviews, comments and Chef.io reviews across a wide range of social media sites. The data is then presented in an easy to digest form showing how many people had positive and negative experience with Chef.io. With that information at hand you should be equipped to make an informed buying decision that you won’t regret. What are Chef.io pricing details? What integrations are available for Chef.io? If you need more information about Chef.io or you simply have a question let us know what you need and we’ll forward your request directly to the vendor.